Did you know that, according to the latest Statistics Canada data, 22% of Londoners identify themselves as culturally diverse? More than 140 language groups make up the mosaic of our London landscape. 20% of London population have mother tongues other than English and French. London is becoming more and more diverse in culture, ethnicity and language. This is also true for the churches in London. We have many ministries and faith communities that target specific language and/or ethnic groups in London, and we also see the growing need of multicultural or multilingual ministries in the churches in London today. One of the strategic steps the CCNL is taking for the next three years is “to actively engage more diversity in CCNL.” Jesus says, “A new commandment I give to you, that you love one another: just as I have loved you, you also are to love another. By this all people will know that you are my disciples, if you have love for one another” (John 13:34-35 ESV). All those who believe in the name and saving work of Christ should see themselves in the future of God’s kingdom at work in this city with other Christian leaders. We want to see the pastors and Christian leaders in London to come together for fellowship and building a trust relationship with one another regardless of their cultural/ethnicity, age, gender, denominational and theological background. On Thursday, March 21, about 70 pastors and Christian leaders, from various ethnic/cultural backgrounds, gathered at London Chinese Alliance Church to celebrate the diversity in London. The title of the event was “Diaspora Churches in London,” and Pastor Garry Fess, the lead pastor of Royal View Pentecostal Church and the chairman of the CCNL board, greeted and opened the program. Barry Slauenwhite, the president and CEO of Compassion Canada, gave a presentation on the cultural diversity in London. Three speakers, Pastor Daniel Kwong, the senior pastor of London Chinese Alliance Church, Pastor Mario Vaquedano, the associate pastor of Spanish Ministry at West Park Baptist Church, and Sam, a leader of Persian Church in London (full details not disclosed for privacy). Pastor Daniel shared about his life and journey as a pastor. He has been serving in the same congregation for more than 28 years now. He shared about his struggle in the past due to many Chinese immigrants, who initially settled in London then moved to other cities for better opportunities. His church membership suffered significantly at one point and he thought of stepping down. Then, God miraculously granted him to speak fluently in Mandarin, so he could minister, not only to Cantonese speaking Christians, but also Mandarin speaking Christians as well. Pastor Daniel encouraged other pastors to not give up but put their trust in the God who never gives up on us. Pastor Mario spoke about Migrant Workers Ministry he established. 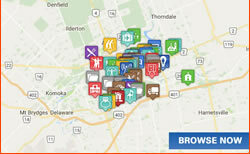 Migrant Workers Ministry serve hundreds of migrant workers in Canada, who often come from Mexico. The ministry creates a space for fellowship among workers and make them feel home in Canada, and ultimately present the Gospel to them through various opportunities. The ministry is established in four churches in London and greater area, and has seen much fruit in bringing them to Christ, baptizing them and growing them to live and work as Christians. Last year, they held a migrant workers convention and saw over 250 working men and women gathered to worship, fellowship and learn. Lastly, Sam presented the ministry he and his wife, Hanni, are involved overseas and in London. They produce and distribute Christian literature and resources in Persian and help establish Persian churches and Bible clubs. Their works are certainly one of the front line missions in the world and require much prayer and support. It was also delightful for participants to know that the date of the event is Nowruz, the Persian New Year. Pastor Junior Sorzano, the lead pastor of London First Church of the Nazarene, invited everyone to join in reciting the Lord’s Prayer in their own mother’s tongues. This was truly a blessed moment, as it reminds of Revelation 7:9. The program was followed by lunch and the cooks provided delicious Chinese cuisine. During the lunchtime, all pastors and Christian leaders were connecting with one another, sharing their stories and encouraging each other in the Lord. Many expressed that they would like to see this happen more often. I pray that this is not just an event, but the beginning of something great that can only be achieved when churches truly unite together as one body in the Lord. 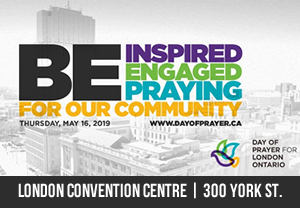 I’m looking forward to seeing many of pastors and leaders coming together once again for the day of prayer on Thursday, May 16 at the London Convention Centre.